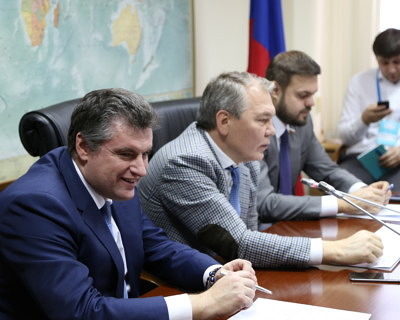 A meeting of the Committees for International Affairs and the Committee on CIS Affairs, Eurasian Integration and Relations with Compatriots with participants of the First Youth Forum of the State Duma was held. The theme of the meeting was: “Is it possible for the truth for foreign money?”. “Everything that concerns today’s information security is a matter of number 1. We often say that, unfortunately, the deformation of Russia’s image in the world has reached tremendous limits, because our information tool, the best on the planet, is propaganda and counterpropaganda in 1992-93 was rejected as unnecessary, and today they do what they want with our image, “Slutsky commented on the current situation. Recently, amendments were made to the status of foreign agents for foreign media in the case of financing from abroad. Young people offered to promote this idea in the CIS countries. Head of the profile committee Leonid Kalashnikov agreed – the topic can be raised within the framework of the Interparliamentary Assembly. The State Duma intends to listen to the opinion of the youth. If successful, the Youth Forum of the State Duma will be annual, the State Duma chairman Vyacheslav Volodin promised.